You are here: Home › FAQ › What is a Self Erecting Tower Crane? A Self Erecting Tower Crane (SETC) is a Tower Crane that can be easily inserted on a site with restricted space in a short period of time. These cranes operate from a fixed position and must be safely placed on site by qualified field engineers familiar with the mechanisms that they are using. A Self Erecting Tower Cranes is normally operated using a crane remote control, though in some cases an operator cab may be fitted to the tower section. Self Erecting Towers Cranes are ideally suited to light frame structure, however they can offer many advantages on most projects requiring a fixed position city tower crane. As it operates from a small footprint the safety of the sites that the SETC is placed on is increased due to fewer site movements. 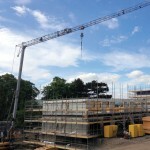 For more information on Self Erecting Crane Advantages click here. Mantis Cranes provide Self Erecting Towers Cranes ranges in job length from 25m to 45m and lifting capacity from 2000kg to 6000kg nationwide across the United Kingdom. To find out more of arrange a crane hire call us today.